This man divided his goods between his servants, entrusting each with a certain number of talents (a “talent” is measure of weight, typically used for silver, that is equal to 30 kg or 66 lb). This pictures the time that we’re in now as servants awaiting our master’s return. Like the servants in the parable, we’ve each been given gifts “according to his own ability” and must now decide what to do with them (Matt. 25:15). Each servant made a decision about what to do with the gift. Two tended and increased what they’d been entrusted with, but one put it away out of sight. His problem wasn’t that he’d received less than the others, but that he didn’t respond to what he’d been given in the right way. In a version of this parable recorded by Luke, ten servants are each given equal gifts and the outcome is still the same. Some produce a 10-fold increase, some 5-fold, and some produce nothing at all (Luke 19:11-27). I’ve been using the word “gift” so far to talk about what God has given us, but it’s not quite what we might think of when we typically think of gifts. After God gives salvation, His Spirit, and similar gifts to us they don’t belong to us to do with however we please. “Salvation belongs to Yahweh” (Ps. 3:8), and it’s by His grace that we’re made partakers. It is a gift in the sense that it is freely given, not in the sense that ownership is transferred to us. The parable of the talents functions the same way. The master gives the servants his goods to hold in trust. They are stewards of something that belongs to another, just as we are “stewards of the manifold grace of God” (1 Pet. 4:10, LEB). Eventually, we’ll be called to account for how we handle that gift. As the servants come before their lord, the ones who increased their talents both hear, “Well done, good and faithful servant. You have been faithful over a few things, I will set you over many things. Enter into the joy of your lord” (Matt. 25:20-23). 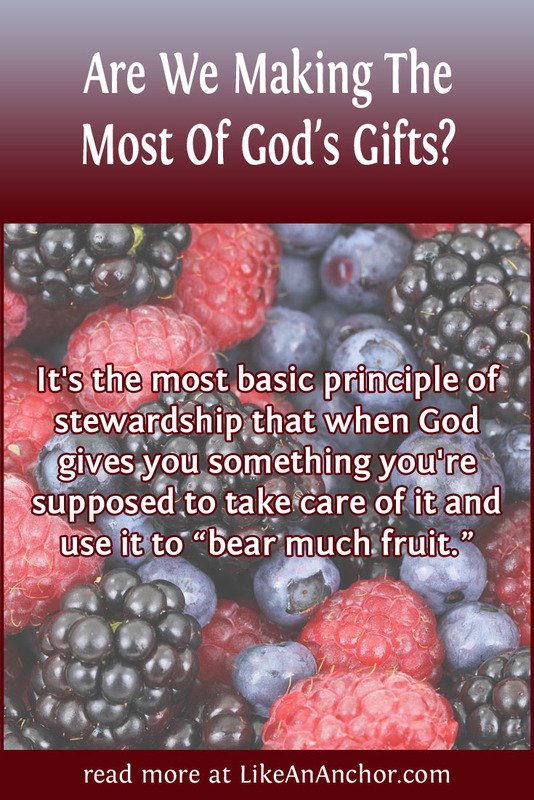 It is the most basic principle of stewardship that when God gives you something you’re supposed to take care of it and use it for good, and that’s what these servants did. Whatever our role in life and in the church, we’re supposed to faithfully follow God in all that we do. We must always live as if today is the day our Lord will call us to account for what we’ve done with the grace, Spirit, life, and every other good gift that He has given us. Receiving the gift isn’t enough. We also have to let it change us. The servant who hid the talent and gave it back exactly as he received it was not praised. Even though he had what he thought was a good excuse, “his lord answered him, ‘You wicked and slothful servant’.” At bare minimum, the lord says, this servant should have put the talent in the bank where it could have earned interest. Because the servant didn’t do anything to grow his gift, it is taken away and he is thrown “into outer darkness” (Matt. 25:24-30). We know words alone can’t save our souls, but this is logos (G3056) — the same Greek word used to describe Jesus as the Word of God (John 1:1-4; Rev. 19:11-13). Putting on Christ and internalizing His words is part of the salvation process. It’s not enough to just hear His words. We also have to act on them. It’s imperative that what we learn from and about Jesus Christ changes how we live. We don’t want to meet Him someday and hear Him ask, “Why do you call me, ‘Lord, Lord’ and don’t do the things which I say?” (Luke 6:46, WEB). 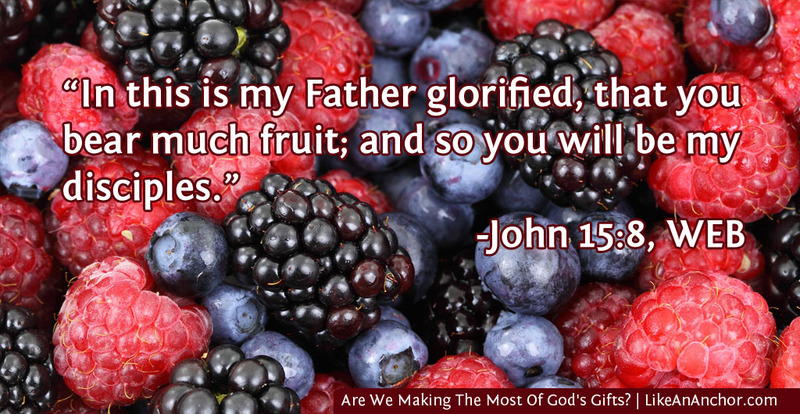 Jesus told us, “In this is my Father glorified, that you bear much fruit; and so you will be my disciples. (John 15:8, WEB). 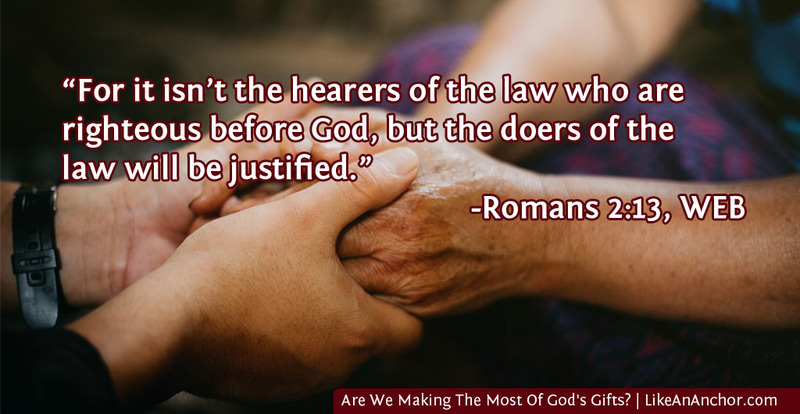 If we’re not bearing fruit, it’s a sign that we are not connected to Christ, we are not His disciples, and we are not glorifying God the Father. We will be judged by how we respond to all God’s gifts, which means we need to ask ourselves some serious questions. Is the holy spirit multiplying in me and you, resulting in good fruit? or do we ignore the gift and risk it being taken away? I write this post not to scare us or make us feel like we’re failing, but to stir us up (me included). Our God is merciful and will judge us kindly. He just asks that we listen to His word, follow Jesus, and bear good fruit (Gal. 5:22-23; Eph. 5:9). In short, He wants to see us respond to the gifts He’s entrusted us with in a way that shows how much we value our relationship with Him.